My son was looking through the Toys R Us catalog last night and I was looking over his shoulder. I just about fell off the couch when he turned to this page! 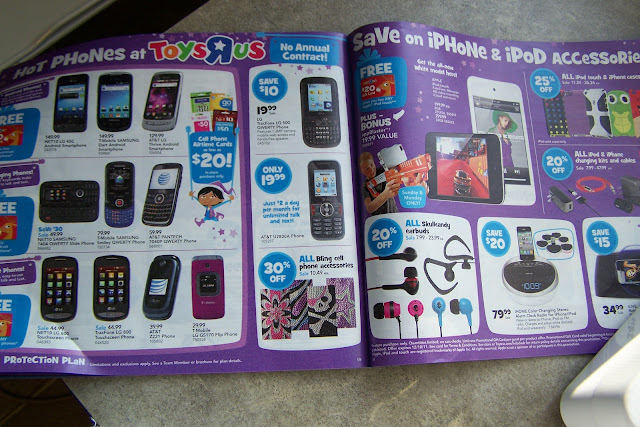 There’s just a part of me that feels sad to see cell phones in the toy store catalog. I’m not criticizing Toys R Us for capitalizing on a business opportunity. I think I’m just lamenting the loss of childhood. He is at the age where he doesn’t quite know what toys he wants. And that makes me sad, too. Not me. I planned wacky relays and fun games. Kids are never too old to play games. They can talk and text and Facebook (ok, they don’t talk anymore, really) anytime, but they can’t act like kids too often! Guess what – they always had fun at my parties. they do not give parents a sense of security. In fact, I postulate that they can increase anxiety because we think we can be in touch with people 24/7 – and the first time your kid doesn’t pick up? Well, let’s just say you’ll have a few anxious moments. The kids pay for their own phones and service. If they want it as a social toy, then they pay for it. Now that my older daughter is in college she has learned to disconnect from her friends. She is so busy with her studies that it has been necessary to do so. I am not against cell phones. I’m just against that we allow these things at younger and younger ages and they are giving our kids access to other kids 24/7. Let’s give kids the gift of time – the gift of play – the gift of fun. If you want ideas other than cell phones for your kids, head on over to Clover Lane. My friend Sarah always has great ideas! She shares some toys ideas here and her husband shares some great games here! That catalog makes me VERY sad. My boys all have phones and have been a “life saver” when they are all at three different places and I am racing to pick up each one. However, they are also very annoying and I wish I didn’t need him. I was so proud of my 14 year old for actually picking up the phone and talking to a girl and ask her to homecoming. I think I would have died if he asked by text! So yes…there is a time and place. But good old fashioned play allows freedom and creativity!!! that is just disgusting. cell phones in a toys r us catalog? it just goes to show how much our values have changed as we become more and more technologically advanced.